I rarely buy clothes online. I do a lot of wistful window shopping through fashion blogs, but don't trust anything but t-shirts to fit without trying them on first. Even while shopping in person, I have a tough time finding a dress to flatter my hourglass figure. Hence why I wear skirts almost weekly when the weather's nice, and dresses only at weddings and holiday parties. Dress shopping can be such an ordeal. 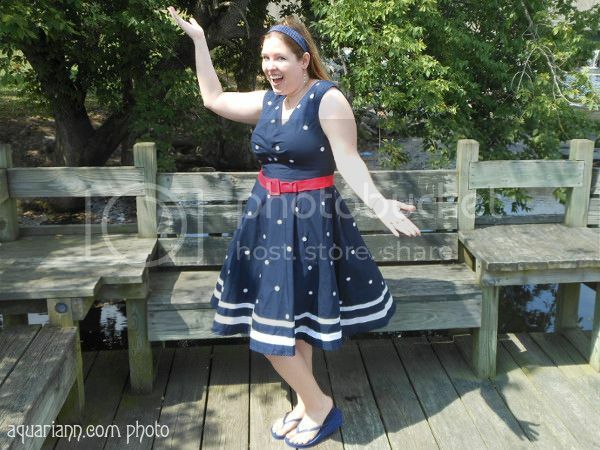 You might have heard my shriek of excitement when, only a week after reading La Vie En May's Customization Made Easy blog post about eShakti.com, they contacted me to write a review! 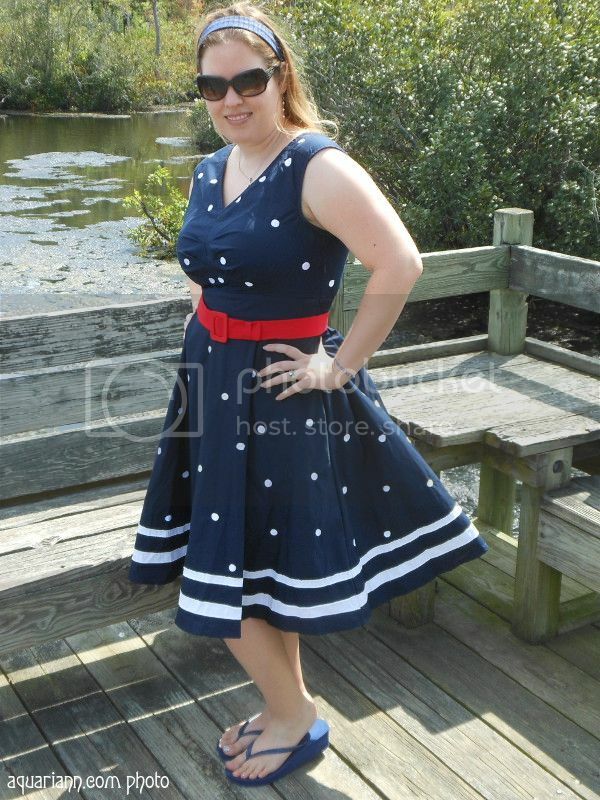 After browsing the available dresses for bloggers, I finally chose an Americana dress of navy blue fabric embellished with white polka dots, white stripes and a red belt because I thought it'd be cute to wear on patriotic holidays. 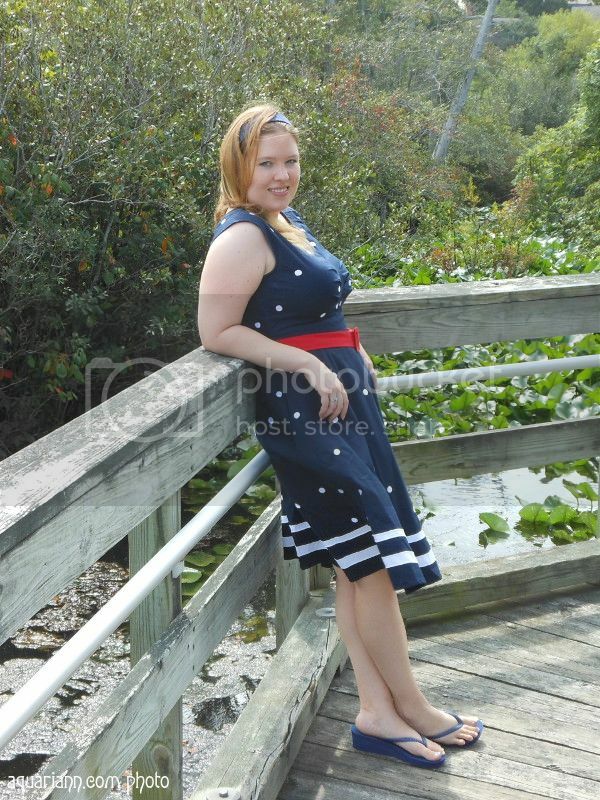 Plus, I live near the ocean so the nautical trend is always in style. Then came the big decision of what size to order. Dresses are usually too long for me at 5'5", so it was a nice surprise to read the size chart description that their standards are proportioned for women 5'4" to 5'7", where hips are slightly larger than the bust. My bust, waist and hip measurements were surprisingly similar to a standard size 14 (they offer sizes 0-36! ), but if they weren't, I could have submitted custom size measurements, which is a free feature for the first order and $7.50 for future purchases. Step 2 was to input my height, which gave me hope that maybe the length would actually end at my knees like it did on the model. Step 3 was an optional upgrade to custom styling. Had I not loved the design so much as is, I could have added sleeves, changed the length or even deepened the V neck. I also could have removed the pockets, but as I haven't ever owned a dress with pockets, I thought it'd be fun to keep them, even if I probably won't use them. Even with all the impressive detail when ordering, I was doubtful that the dress would fit perfectly, given my track record with fitted dresses and trying to tug so many over my chest in drab dressing rooms. But eShakti's package arrived three weeks later and tada, it did! A partial side zip closure and elastic smocked back waist made it easy to slip over my curves. 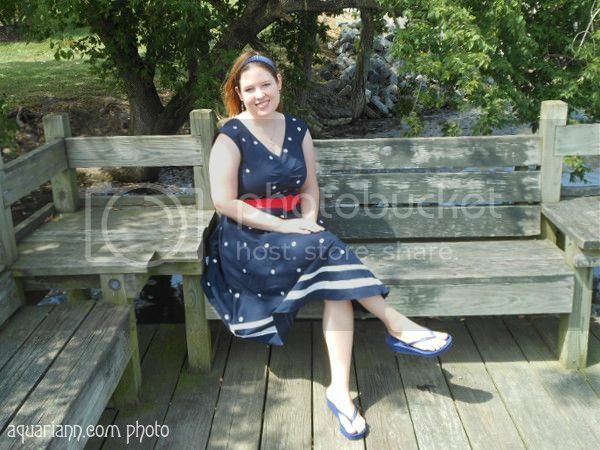 Okay, my hair's a hot mess in this one from the wind, but I thought it was the best example of the knee length because my Ogre took the photo from far enough away that him being a foot taller than me didn't distort my legs. The cotton poplin fabric is comfortable to sit in, but still heavy enough that it doesn't accentuate belly rolls when doing so. 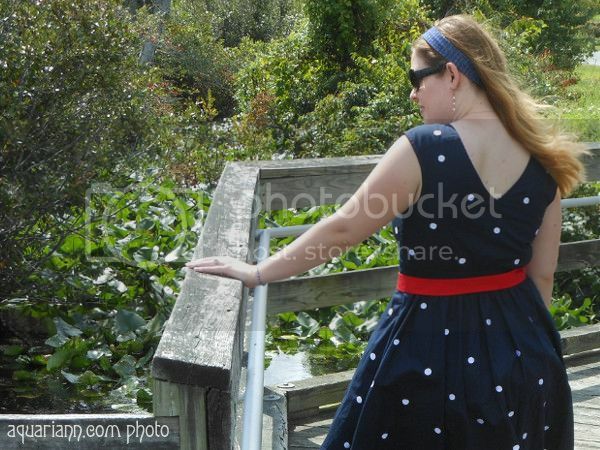 The retro-inspired silhouette of the polka dot print dress makes me feel like a 1950s movie star! But I'm not and don't have any modeling skills, so only now did I realize that I should have shown off the pockets by putting my hands in them for this pose. After this experience, I won't be so quick to turn my back when ordering dresses online. Granted, I'm a frugal fashionista and still wouldn't treat myself without an occasion, a discount and an eyelash wish that another design would fit just as attractively - but it's nice to know that eShakti is an option. If you're like me and refuse to buy almost anything but eggs at retail price, eShakti is offering my readers a 10% off coupon, which cannot be used on clearance / sale, gift cards and overstock categories or previous purchases. Just enter "aquarianns" into the promotional code box at checkout before September 22, 2014. You can also follow eShakti on Facebook, Pinterest and Twitter to get updates on special sales. Disclaimer: I received this free dress in exchange for an honest review. If you think your product would harmonize with my whimsical ramblings, please request a review using my contact form. Aww, thanks for the mention Kristin! You look gorgeous in your dress. I love the pop of red, it's very fun! Oh that is the most perfect dress! Thanks for sharing your great find ! Love love love that dress!!! It's just the kind I like to wear. Looks so great on you!